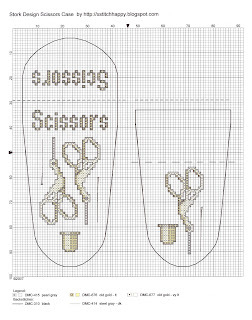 Today's chart is for a scissors case. I think 16ct or 32ct over two threads will probably work best. 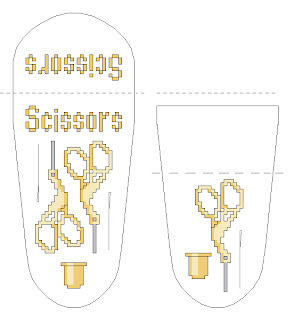 There will be matching scissors fob and needlecase charts (maybe a biscornu as well?) over the next few days. The small dotted line is not stitched it is just to show the fold line for the flap and the larger dashed line is just to show the point that the flap will overlap to on the front. it is very beautifull ! Thank you! I never was sure of the shape it should be. This is a tremendous help! My friend Alexia said to mee to visit your blog which is superb and you made very nice things in crosstiching. I love this scissor case and I hope I could realise in a short future. Excuse me if my english is not very good but I left scholl 30 years ago. I will return hear nearly ! I love this simple design - I've been looking for something like this for a couple of months. I just completed a WIP bag, and I need a way to keep my scissors from getting lost inside! I've added you to my "favorite blogs" link on my blog. Thanks for all you do - I ta about keeping stitching inexpensive - isn't that one of the reasons we all started this addiction? This is very pretty. As all of the designs here :D Is there a tutorial somewhere on how to sew it together once it's stitched? I'm a noob when it comes to practical cross stitches!